ALLON/Z: Convertible Parkour Apparel—From Suite to Street! ALLON/Z (from the French allons-y—meaning "let’s go!") is a fashion line specifically designed for parkour practitioners. The convertible-wear allows athletes to transition seamlessly from their regular exercise routine to any social event. Students Smruti Adya, Bernice Wong, and Andrew Schlesinger and were inspired by parkour's philosophy of freedom, balance, and self- expression. "We wanted to design apparel that integrates with every aspect of your life—whether that means work, sport, or play," they reason. "Our goal was to design apparel for parkour enthusiasts who want to go from street to work...and back." The project began with identifying parkour as a youth subculture of interest. The designers explored a variety of product design ideas within parkour, but ultimately decided upon convertible apparel. This focus was driven by three research insights: First, they noticed a style dichotomy between "extremely baggy" and "stylish, slim-fit pants and joggers." Second, they encountered a negative sentiment towards the all-black streetwear style associated with parkour. Finally, after attending a parkour instructional class and meeting with the teacher Mike Araujo—one of the first parkour practitioners in New York City who instructs around both Manhattan and Brooklyn—their hypothesis was confirmed: “I want to be able to go from parkour to the bar,” Mike exclaimed. 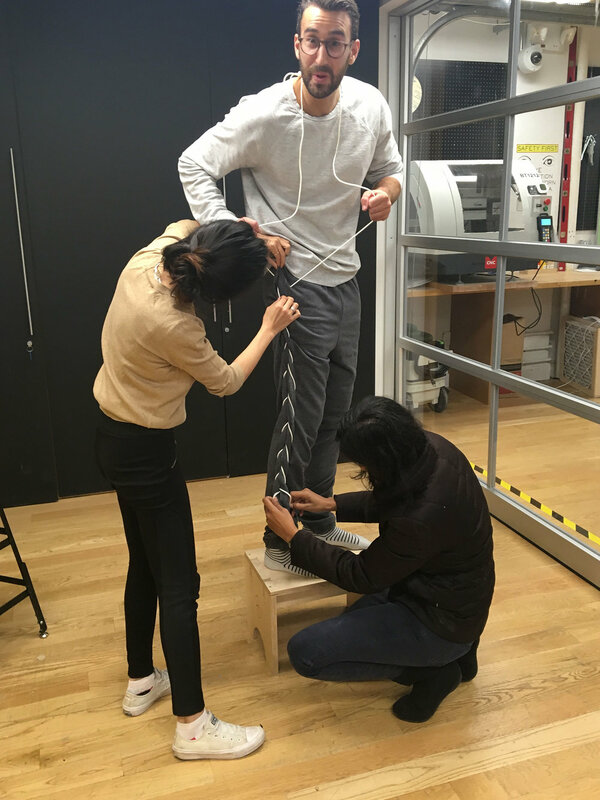 The team designed two pants: the TW/ST joggers and FL/P unisex wide-leg pants. The pull-on TW/ST joggers are cut with a slim-fit leg and elastic banding at the ankle. Styled with a zipper that spirals around the calf and ankle, wearers can unzip to relax—revealing the hidden highlight material. The exterior of the TW/ST is made with 100% cotton and features a navy colorway. The accent material was chosen to effect maximum contrast: neon orange cotton spandex. The pants also incorporate an elastic waist with an adjustable drawstring...for the perfect fit! 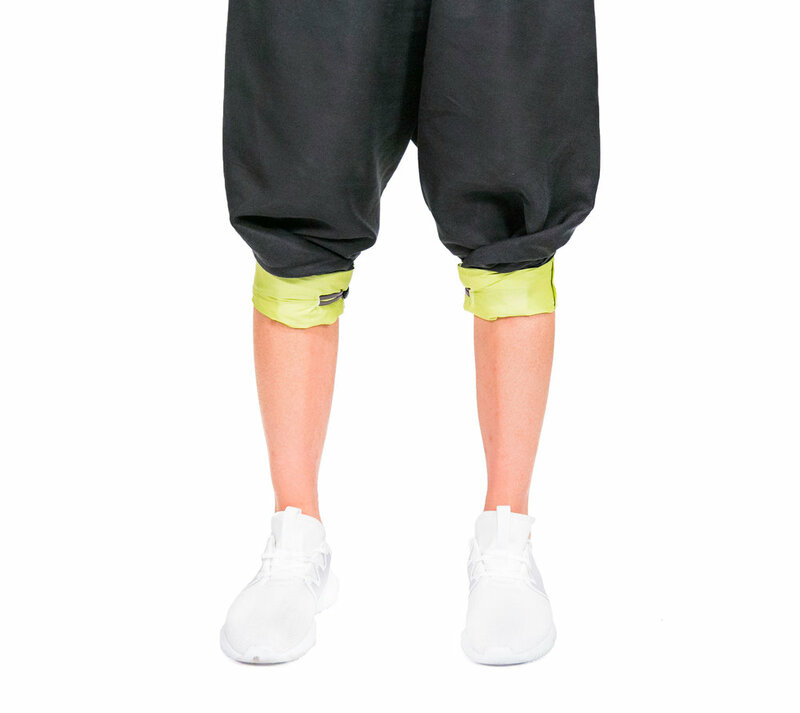 The FL/P unisex wide-leg pants can be converted into long, active shorts that cinch just below the knee. With a buttoning wrap-around detail in bright green, the FL/P pants balloon into a wide silhouette—inspired by the existing XXL sweat pant aesthetic that many traceurs and traceuses prefer. The pants incorporate both an elastic waistband and ribbon for a secure fit so that athletes can move with complete ease. “Our pants performed well during our photoshoots, which was turned out to be a pretty rigorous user test as we were in constant motion—similar to parkour!" 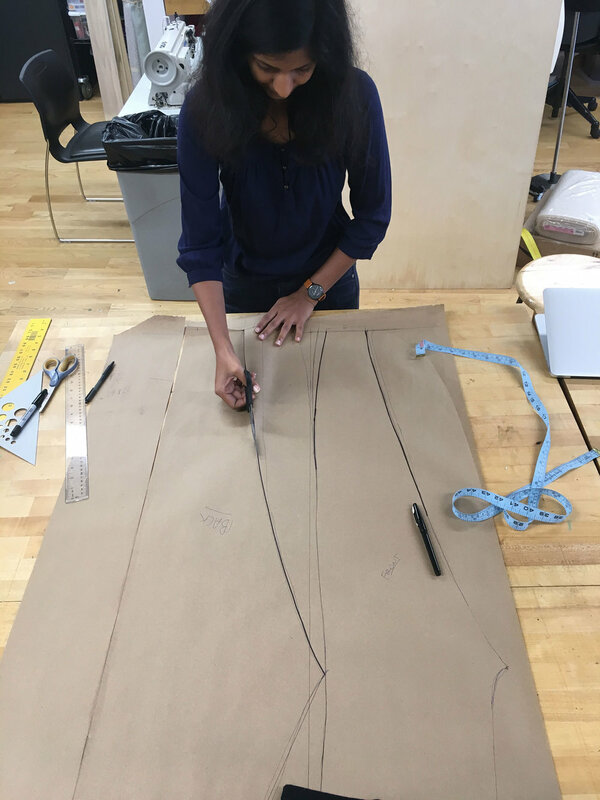 The biggest success for the ALLON/Z team came in actually constructing the pants. 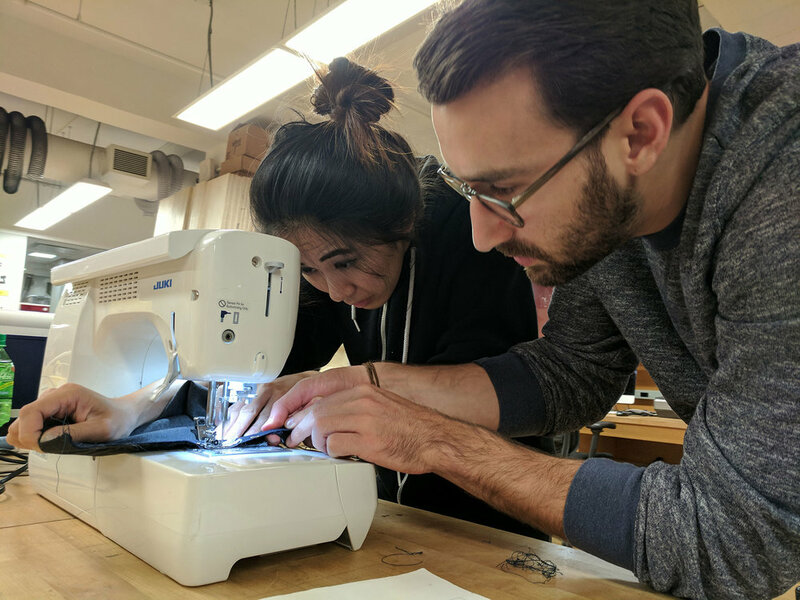 From general pattern making, to material exploration, to the fine details of adjustable drawstrings, the team was really able to dig into the intricacies of apparel construction. “Our pants performed well during our photoshoots, which was turned out to be a pretty rigorous user test as we were in constant motion—maybe similar to parkour?!" ALLON/Z is moving forward by identifying a small scale manufacturing firm to produce multiple sizes and samples in preparation for a Kickstarter campaign. Additionally, a prototype vending machine will be created to test out the interaction and experience for a marketing campaign. You can learn more about ALLON/Z at https://www.allonz.co/, and pre-order your favorite items right here!